Calcium is an important signalling ion, and changes in Ca2+ concentration ([Ca2+]) regulate diverse processes in many cellular compartments. In excitable cells, depolarisation-induced Ca2+ entry increases [Ca2+]i, leading to secondary changes in [Ca2+] within organelles such as mitochondria and ER that regulate specific Ca2+-sensitive targets within these organelles. Although mitochondria accumulate Ca2+ in response to depolarisation-evoked [Ca2+]i elevations (see The Colegrove et al Model Of Mitochondrial Ca2+ Uptake And Release, 2000), the ER is also an important component in Ca2+ signalling in virtually all non-muscle cells, and it has been described as either a Ca2+ source or sink. Different modes of net ER Ca2+ transport are expected to have very different effects on cytoplasmic and intraluminal Ca2+ signals and on the processes they regulate (see The Albrecht et al Model Of Multiple Modes of Ca2+-induced Ca2+ Release in Sympathetic Neurons, 2001). In a follow up study to their 2001 paper, Meredith A. Albrecht, Stephen L. Colegrove and David D. Friel have examined how differential regulation of ER Ca2+ uptake and release rates accounts for multiple modes of Ca2+-induced Ca2+ release. 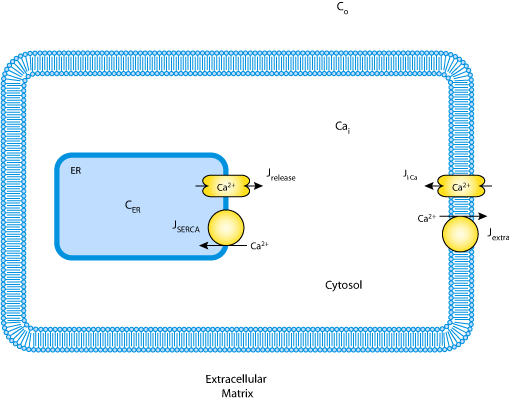 Three different macroscopic Ca2+ fluxes were modelled: JSERCA, the rate of Ca2+ uptake via SR Ca-ATPases; JICa, the total cytoplasmic Ca2+ flux when SR Ca-ATPases are inhibited; and Jpm, the rate of Ca2+ extrusion across the plasma membrane. One additional flux Jrelease was calculated from the difference between JICa and Jpm (see the figure below). This mathematical model has been translated into a CellML description which can be downloaded in various formats as described in . Derived from workspace Albrecht, Colegrove, Friel, 2002 at changeset 1668c60f12ca.